Dietsmann is fully committed to complying with the most stringent health safety and environment (HSEQ) standards. This is why Dietsmann not only applies all the clients’ safety rules on site, but has also formulated its own set of 12 rules that are directly related to the Company’s core business. One of the Dietsmann 12 Safe Maintenance Rules deals with lifting operations. 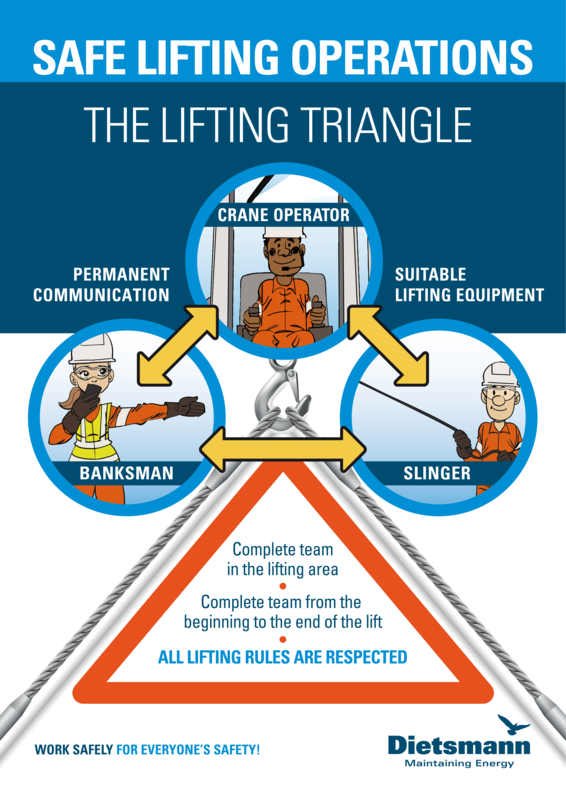 Why rules for lifting operations? Our goal is to address the essential issues related to the key risks our employees face during their day-to-day work. Lifting operations can be risky if not carried out properly. Like all the other procedures, instructions and rules that apply to staff assigned to the installations on which Dietsmann’s employees are working the Dietsmann rules for safe lifting operations must be adhered to. The complete team must be in the lifting area throughout the lifting operation. Equipment and organizational measures have been defined for each lifting team member. To ensure safe lifting at all sites specific documentation has been produced for each site. Work safely for everyone’s safety!